Remember all the fun we had as we watched the antics of the cast in Daddy Day Care? Well, let me tell you, you will laugh HARDER with the newest installment – Grand Daddy Day Care! A hilarious comedy for the whole family to enjoy, Grand–Daddy Day Care is now available on DVD, Digital and On Demand from Revolution Studios, a subsidiary of Content Partners, and Universal 1440, the original content production arm of Universal Pictures Home Entertainment. When Frank Collins (Reno Wilson) suffers from writer’s block, he decides to start a day care for his father-in-law (Danny Trejo) and other seniors as a way to make quick cash, while giving him time to still work on his next book. Eventually getting a small group to care for, Frank soon learns that these are not your typical seniors and they can’t be easily corralled. With a code enforcement officer challenging the legality of his business, and his senior charges getting into all kinds of trouble, Frank’s work days become anything but effortless. 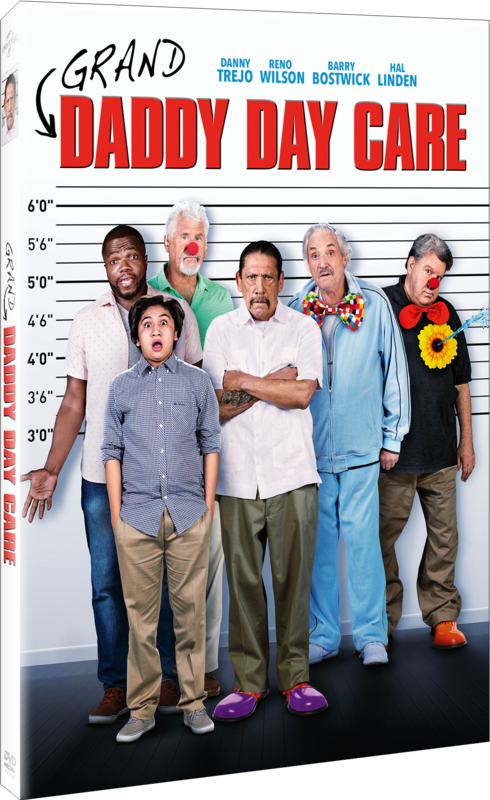 Featuring an all-star cast of TV’s greatest stars,Grand–Daddy Day Care is a hilarious story for the young, and the young at heart. Starring Danny Trejo (Machete, Dead Again in Tombstone) and Reno Wilson (Transformers franchise, “Good Girls”) along with supporting cast members Barry Bostwick (“Inside the Extras Studio,” The Rocky Horror Picture Show), Linda Gray (“Hilton Head Island,” “Hand of God”), Julia Duffy (“The Cool Kids,” “American Housewife”), Alec Mapa (You Don’t Mess with the Zohan, Marley & Me), Garrett Morris, Margaret Avery (“Being Mary Jane,” Proud Mary), Roxana Ortega (“The Loud House,” “The Santa Clarita Diet”), (Coneheads, “Saturday Night Live”) and George Wendt (“Cheers,” “Modern Men”). I had the opportunity to pre-screen the movie before it’s street release and let me tell you, I absolutely loved it! You know, as a middle-aged woman with an elderly mother, I can appreciate the message behind this movie. You don’t want to underestimate the feelings of those growing older in their years. The movie is has a message that will affect everyone either directly, indirectly or by association. It will eventually be all of us, someone getting older, retired and under the care of our adult children. See this movie with your kids AND your parents and appreciate the message within this great movie. Danny Trejo has long been one of my favorite actors and his portrayal in this is unlike anything I have seen him do before. Great Job, Danny!